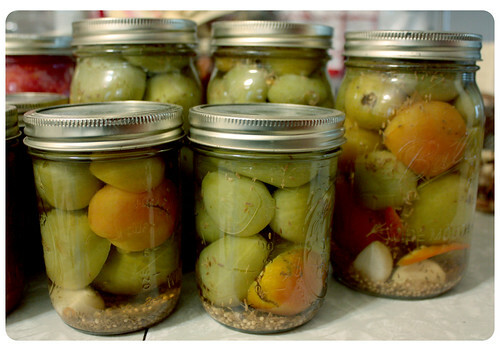 Pickled green tomatoes are sooooo good. A serious party pleaser as well as gourmet garnish to spruce up your next hot dog night. They are as easy to make as they are to eat. Yum! Who doesn’t love pickles? Enough talking, lets pickle. 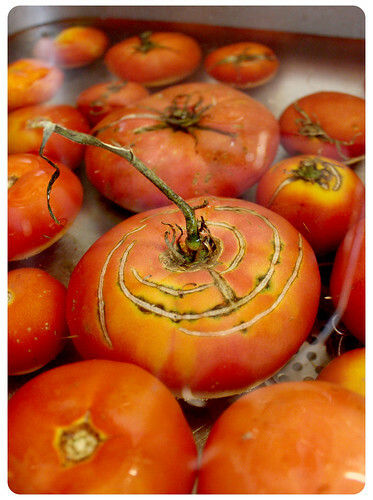 Prepare tomatoes: Wash and remove stems. You may want to cut large tomatoes in halves or quarters. I find its best to use small ones you can leave whole. Stuff jars as full as possible with tomatoes. Make sure nothing is sticking up above rim of jar. Add brine: Pour boiling brine into jars leaving half inch head space. Wipe edges of jar to remove any materials which might impede lids from sealing. Seal using boiled seal and screw on lid. Screw lid on tight. Process: Process in rapidly boiling water: pint jars for 5 minutes, quarts for 10. Beginning timing when water in canner comes back to a rolling boil. When time is up, remove from water and allow to cool on counter top. Do not jostle jars as it can impede a proper seal. 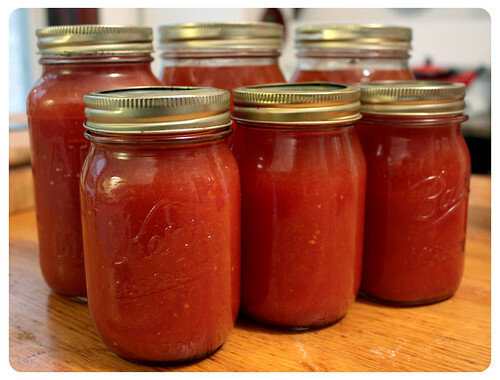 Not only is homemade tomato juice awesome and delicious, its a great way to get rid of ulgy damaged tomatoes. 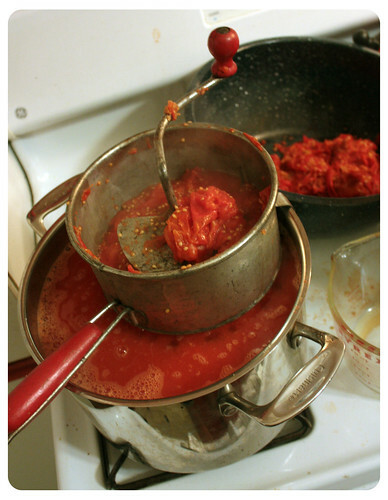 I usually make this last, after processing my whole tomatoes and marinara, so I can use any excess juice or scraps from the other tomatoes. Nothing makes for an amazing spontaneous brunch party then a quick bloody mary with your own juice. Let’s get juicy. Core tomatoes and remove any bruised or damaged bits. 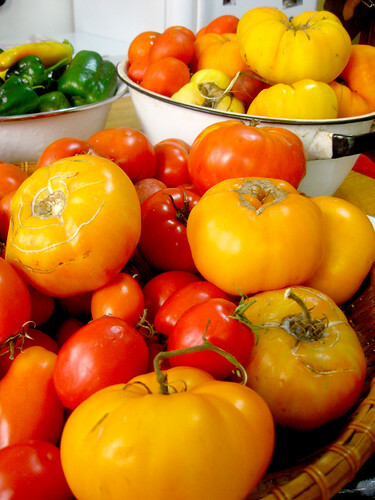 Place tomatoes in a pot and simmer on the stove top for about 20-30 minutes to soften up and allow for easy juicing. Pour into a food mill to remove skin and seeds. If you are lucky enough to have a juicer, you can just use that and skip the simmering step. However, I would still suggest running the pulp waste through a food mill to get as much juice as you can out of the tomatoes. Bring tomato juice back up to a boil. 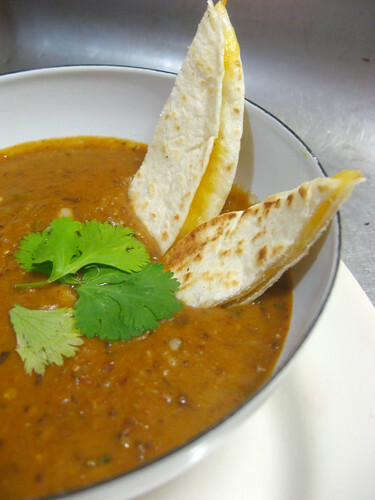 If its a bit watery, you can cook it down until you get the flavor you want. Salt to taste. Wash enough glass canning jars needed for tomato juice. Temper by dipping in the boiling water of your canning pot. Sterilize canning lids in boiling water. Process in boiling water canner 15 minutes for pints and quarts. Beginning timing when water in canner comes back to a rolling boil. When time is up, remove from water and allow to cool on counter top. Do not jostle jars as it can impede a proper seal. Whole tomatoes are one of my top pantry staples. As I spoke about in my last post, rising concern for health risks with store bought canned tomatoes has made it even more important to can my own. 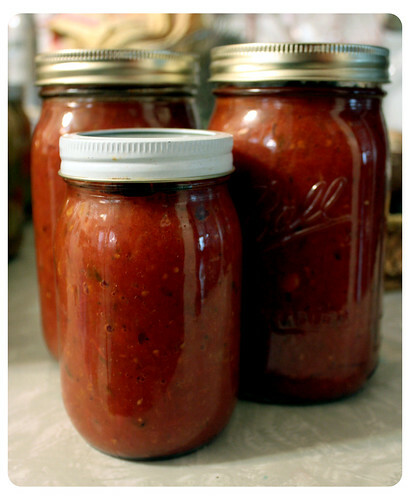 We usually reserve the more meaty Italian plum/roma varieties for canning whole, although you can use any type. We’re going to do fresh pack which means the tomatoes will not be cooked first and will be processed with boiling water. (You can also use tomato juice). Its an easy process, in terms of skill, but can be a bit time consuming. However its worth it. So, lets get going. Wash and rinse tomatoes clean. In a pot of boiling water, blanch tomatoes for 30-60 seconds. 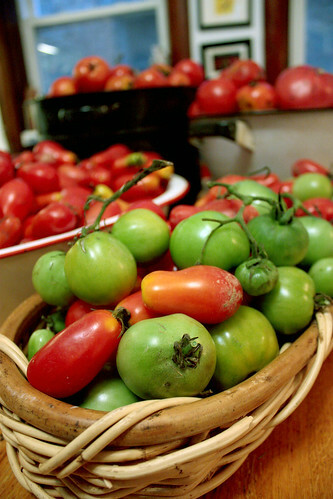 If you want your tomatoes to retain their shape, don’t over boil, as it will make your tomatoes become mushy. However, it doesn’t really matter if they get mushy, and it sort of helps them fit in the jars better. Its merely a matter of your personal aesthetics. 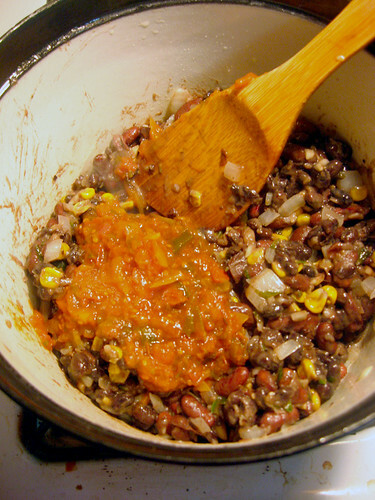 After blanching, use a knife to remove the core. Remove skins. They should peel right off without use of a knife. Boil some fresh water for filling jars, 1 cup for every pint, 2 cups for every quart. In your canning pot, begin boiling water to prepare for processing. Wash enough glass canning jars needed for tomatoes. Temper by dipping in the boiling water of your canning pot. Sterilize canning lids in boiling water. Fill jars with boiling water leaving 1/2″ head space. Its tomato season! With all the information coming out in the past years about how purchased canned tomatoes contain BPA, which increases one’s risk factor for heart disease, obesity and diabetes, I feel like its more important then ever to can my own tomatoes. Luckily, my parents always have a huge garden and can send me home with a few bushels. This year, I think I made off with about 70 lbs of tomaters! 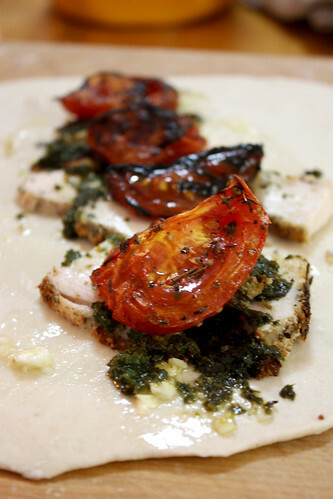 There are so many different things you can do with tomatoes, and each recipe is super easy. 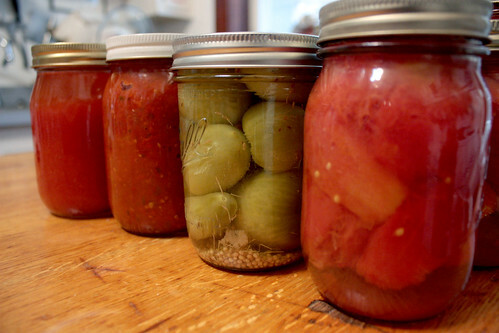 So, whether you have your own tomato plants, or you can get a good deal at a farmers or produce market, you may want to think about canning your own to increase your health and happiness! I’ll be canning mine as juice, roasted marinara, pickled, and whole. Over the next four posts, I will share my quick and easy techniques. So lets get canning! Prep dough: Mix flour and salt. Make a well in dry ingredients and pour water. Place yeast in water and let sit for 5-10 minutes until yeast is disolved and looks puffy. Add oil and honey. Either by hand or using a dough hook on a mixer, gently begin to kneed the dough together. Once dough is smooth, cover with a towel and place near or on top of your stove. Let sit for an hour to rise. 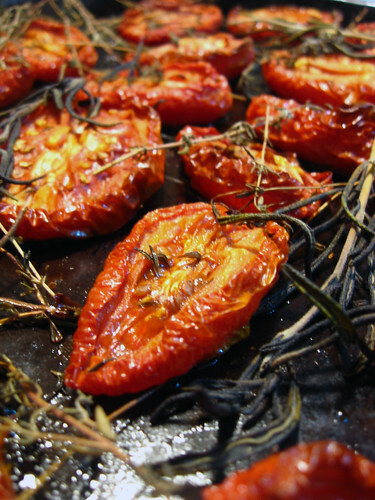 Prep Tomatoes to slow roast: Preheat oven to 250 degrees. Cut tomatoes in half or quarters. 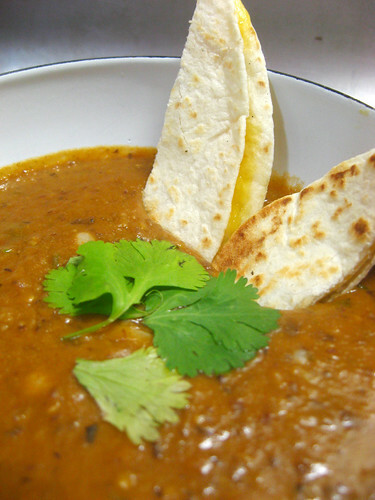 In a bowl, coat with olive oil, sprinkle generously with dried Italian herbs, salt and pepper. Lay out on a baking tray and roast for about an hour. Prep breaded chicken breast: Cut chicken in half through the width of the breast, like you would fillet a fish. Cut slices in half, to make four pieces. Mix dried bread crumbs with Italian seasonings, salt and pepper in one bowl. In another bowl, place egg and lightly beat with a fork. 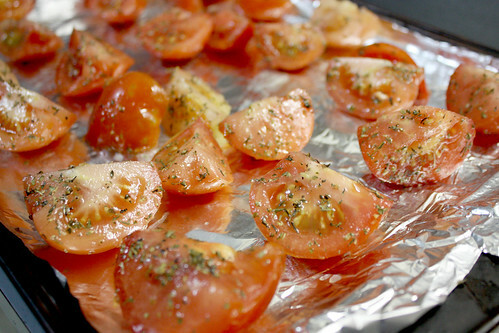 When tomatoes are done in oven, turn broiler on. Take each chicken breast and coat in egg and dip in bread crumbs. Place breaded breasts on a baking sheet and place under broiler for about 8-10 minutes for each side until breading is golden and chicken is cooked. Keep an eye on them, so the bread crumbs don’t burn. Assemble Calzones: Preheat oven to 400. Take your dough and separate into 3 or 4 balls. Roll dough out into circles. Dice your garlic cloves and place in a small dish. Lightly cover with olive oil. Brush garlic oil over middle of dough circles. When chicken is done in broiler, remove and cut into thick slices. Lay slices of chicken over garlic oil. 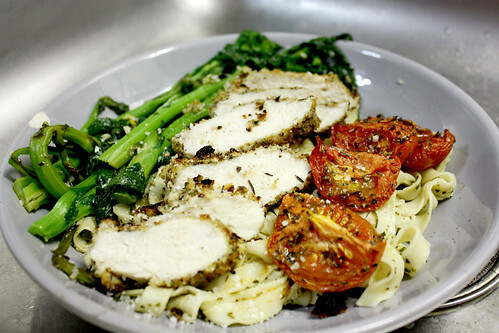 Brush 1-2 Tbs of pesto over chicken. Lay oven dried tomatoes over chicken. Cover well with shredded mozzarella cheese. Using left over egg from Chicken breading process, brush egg yolk around edges of Calzone. Fold close and pinch edges. 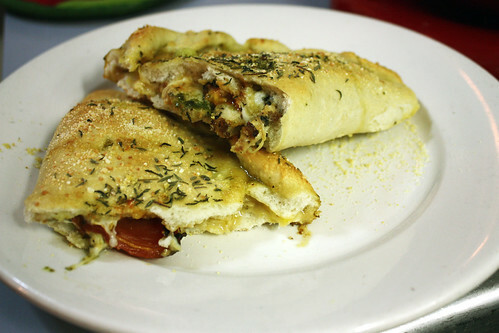 Brush tops of calzone with egg and sprinkle with Parmesan cheese and your choice of seasoning. 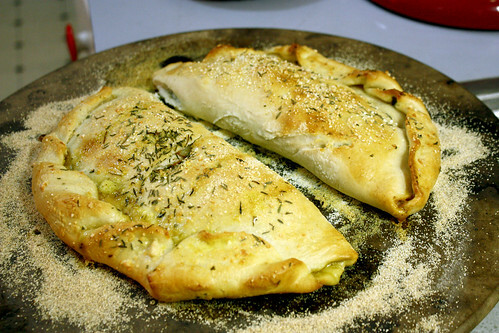 Bake Calzones: Bake at 400 for 15-20 minutes until golden brown. Eat up. Yum! My visit to my parents house this past weekend, produced a harvest of over 30lbs of tomatoes. I’ve been super busy lately (mostly working on a huge redesign of this blog which I hope to be launching in the next month!! More on this later) and I’m really short on time lately. I like salsa, but I don’t have time to chop the ingredients for one batch, let alone 30 lbs worth. What to do? Don’t worry I have a solution. 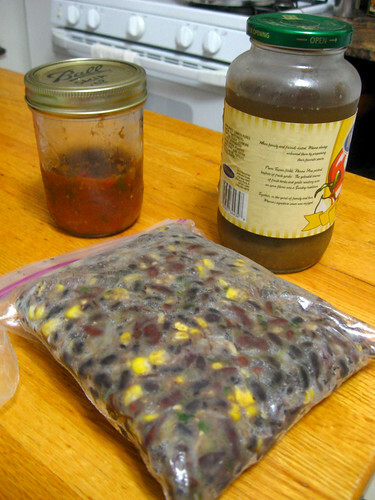 Check out this Instructable to see my time saving salsa recipe along with tons of canning tips. 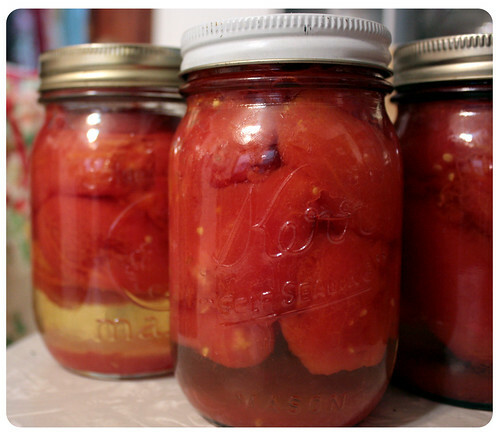 Also, check out the comments for links to tons of online resources for canning methods. Ok, here’s my cliffnotes for you lazy bones: My shortcut to hours of chopping and slicing is to roast all the ingredients together until they are nice and soft, then blend it in a food processor. And you’re done! Beside being a shortcut, the roasting also helps bring out the natural sweetness of the flavors which makes for a delicious salsa! I can get it taken care of this afternoon and and I’ll can it this weekend to preserve it. 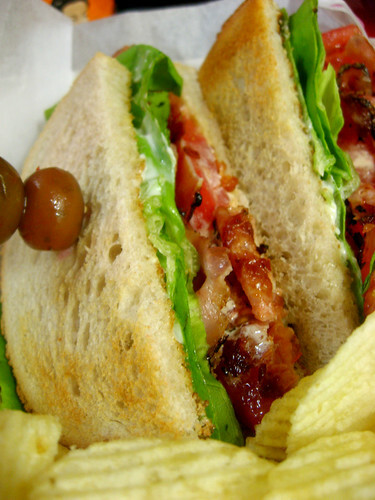 C-BLT? What’s the “C” for, you ask? Representing the makers of my favorite whiskey, rock musicians and sketch “coamody” troup, eh?, its for our hockey loving neighbors to the north! It puts the Canadian in Bacon!